“Honey” is the perfect name for this classic trawler! This second owner purchased her approximately 18 years ago and she has been lovingly cared for to this day. She is very well equipped. Most importantly her engine, the economical Ford Lehman Diesel Model 2715E was widely chosen by Asian builders, has just 300 hours on her since being rebuilt in 2010. 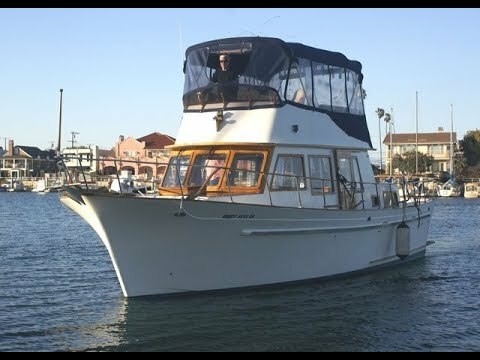 In 2012 she was fitted with a rebuilt transmission, a new propeller shaft and all original teak decks were removed and replaced with fiberglass non-skid. In 2013 all electrical wiring was redone and a 12KW Northern Lights Generator was installed along with Garmin Electronics. 2015 new Aluminum fuel tanks, 2017 all bonding connections were serviced and in 2018 a new refrigerator was installed. The large bridge is completely enclosed making it a great place to hang out with friends. Canvas and isinglass are in beautiful condition. All brightwork was expertly refinished in 2018. Once aboard this classic double-cabin trawler you will love the warm and comfortable accommodations; from teak parquet floors to beautifully carved teak doors and solid brass fittings and portlights. With fore and aft cabins, each with it’s own head and shower, this is the perfect Catalina escape! Outside, the large bridge and wide walk around decks provide plenty of room for entertaining. "When you want the boat sold"
All the main teak decks have been replaced (2012) with all fiberglass and finished with non-skid which is in excellent condition. She is equipped with a wash down pump and spigot, a teak swim platform, window covers and seat covers for the fully enclosed fly-bridge. She has widow covers for all windows which are in excellent condition. Her Bimini top is also in excellent shape as is the isinglass. All of her brite work was redone within the last 6 months and is regularly redone every 6 months like clockwork! She is equipped with a 12 volt electric windlass, anchor and, Line & Chain. The upper and lower helms are well organized, easy to understand and operate. The upper helm is fully enclosed, has great visibility and is equipped with Garmin GPSMAP 740s, Standard Horizon VHF, Com Nav Autopilot, and Sidepower Bow Thruster control making for easy docking and outstanding maneuverability. GPSMAP 740 is a stand-alone touchscreen chartplotter that brings a new level of functionality to your vessel. Featuring a brilliant 7-inch (17.78 cm) display, GPSMAP 740 puts all the information you need right at your fingertips. GPSMAP 740 is preloaded with U.S. coastal maps. In addition, GPSMAP 740 accepts radar input and offers full NMEA 2000® connectivity for greater convenience when adding extra sensors. Although not included, a radome or open array from Garmin can easily be added. Forward cabin has a large V-berth that converts to a double bed with it’s own head with shower, a large hanging locker, plenty of storage and cabin door for complete privacy. Main deck and to starboard is the lower helm with classic spoke wheel with comfortable dinette/settee to port.Large opening windows providing great views and and cross breeze and virtually no water damages. Amidships to starboard is a custom tile countertop galley with salon doors both port and starboard. Aft is the master stateroom with door for complete privacy, a full-size bed and custom tiled enclosed shower stall and head. There is a custom vanity and plenty of drawers and hanging lockers. All interior and bridge upholstery are in like new condition and "Honey" is odor free! Double stainless steel sinks with outside view. Microwave oven, 4-burner propane stove and oven. This is a very roomy and workable station with all the amenities. Drawers and cabinets have been maximized with organizers providing ample storage. 30 Amp Shore Power w 30' Power Cord. Rewired with new main switches in 2012. The Ford 2715E (commonly referred to as a member of the Dorset group of engines) was produced by Ford from October 1970 until September 1981. It is a 120 horsepower, 380 cubic inch, 6 cylinder, naturally aspirated, diesel engine. Some of these engines, like many of Fords diesel engines, were also fitted into tractors, rock crushers, harvesters, gensets, and other equipment by various manufactures around the world. Ford themselves never produced a marine version of this particular engine, however It became very popular, especially in Asian Trawlers, when marinized by Lehman and known as the Ford-Lehman 120. A true work horse! Lien Hwa Boatyard was established in 1978 with substantial investments in modern facilities. Considering the high labor-intensive nature of the boat-building industry, Lien Hwa recruited and trained its own builders to nurture skills and ensure craftsmanship from the very beginning. OEM-business has been the major trend of Lien Hwa Boatyard during the past twenty years. The OEM partners included Blue Ocean ( Holland - power boats), Little Harbor ( U S - sail boats), Marine Trader ( U S - power boats)Trade Winds ( U S - power boats) and currently the Mckinna Yachts. Throughout the years, the experiences and craftsmanship accumulated through these OEM partnerships have become priceless assets to Lien Hwa. "Honey" has been lovingly cared for by her current owners for the last 18years since purchasing her from the original owner! BE SURE TO WATCH ALL OF THE SMY VIDEOS! We use a full time professional CPYB broker, use professional quality photos & brochures, FLIR Infrared photography, pre-inspects the vessel and videos the boat. We even offer "Underway Videos".